Collects X-MEN GRAND DESIGN - SECOND GENESIS #1-2. 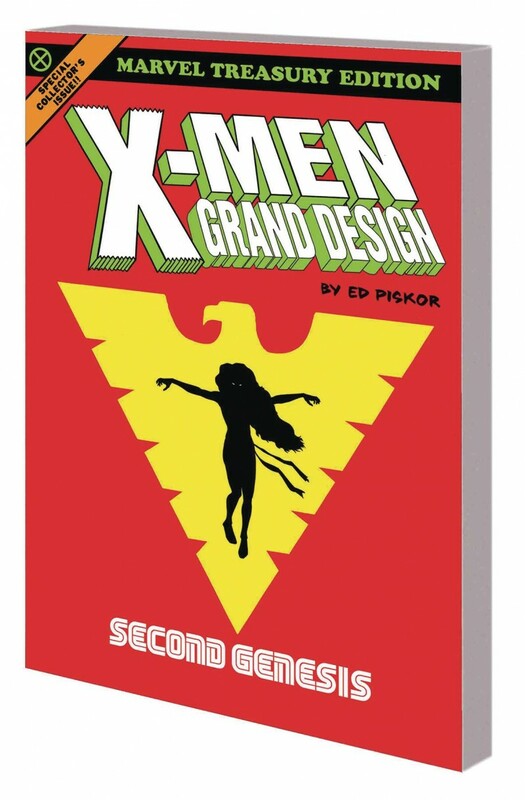 The sequel to the critical smash hit X-MEN: GRAND DESIGN is here - and it’s all-new and all-different! Witness Wolverine, Storm, Colossus, Nightcrawler, Sunfire and Thunderbird suiting up as X-Men for the very first time - all over again! Plus: The return of Banshee! The arrival of the Shi’ar! The Brood! The Starjammers! Watch as Marvel’s merry mutants take to the stars. See the first X-Men adventures of Kitty Pryde and Carol Danvers. And marvel at the grandeur and glory of the now classic Dark Phoenix Saga! All through the lens of indie auteur Ed Piskor - who lovingly researches, writes, pencils, inks, colors and letters every page just for you! This volume also includes an issue of Giant Size X-Men and pinups by Art Adams, Todd McFarlane, Jim Lee and Joe Madureira masterfully recolored by Ed. Presented in the same dynamic, oversized format of the best-selling Hip Hop Family Tree (9’ x 13’).